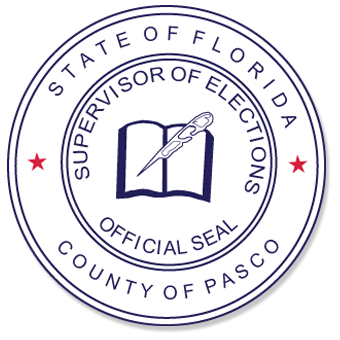 Pasco County FL - The Pasco County Supervisor of Elections, Brian E. Corley, announced Wednesday, April 3, 2019, is the last day to request a vote-by-mail ballot for the April 9, 2019 Municipal and Special Primary Elections. Ballot requests received in the supervisor's office by 5:00 p.m. Wednesday will be honored. Ballots will still be available for pick-up over the counter at the three supervisor's offices until 5:00 p.m. Monday, April 8, 2019, and New Port Richey, Port Richey, and Zephyrhills city halls. Voters wishing to pick up ballots on behalf of someone will need a written request from the voter designating them as the person authorized to carry out the ballot. The designee will be asked to provide a photo ID and to complete an affidavit before releasing the ballot to them. Florida Statutes does not allow for vote-by-mail ballots to be picked up in the supervisor's office on the day of the election unless an emergency precludes the voter from going to their assigned polling place. An affidavit affirming the facts of the emergency will be required. The only exception is voters residing in an assisted living facility. All voted ballots must be physically in the elections' office by 7:00 p.m. Election Day, April 9, 2019, including ballots that were mailed. Voted ballots may also be hand delivered to the Dade City, New Port Richey or Land O' Lakes Supervisor of Elections' Offices in Pasco County. Voted ballots may not be turned in at the polls on Election Day. Voters can check the status of their vote-by-mail ballot at https://www.pascovotes.com/Elections/Ways-to-Vote/Vote-by-Mail/Check-Request-Status.